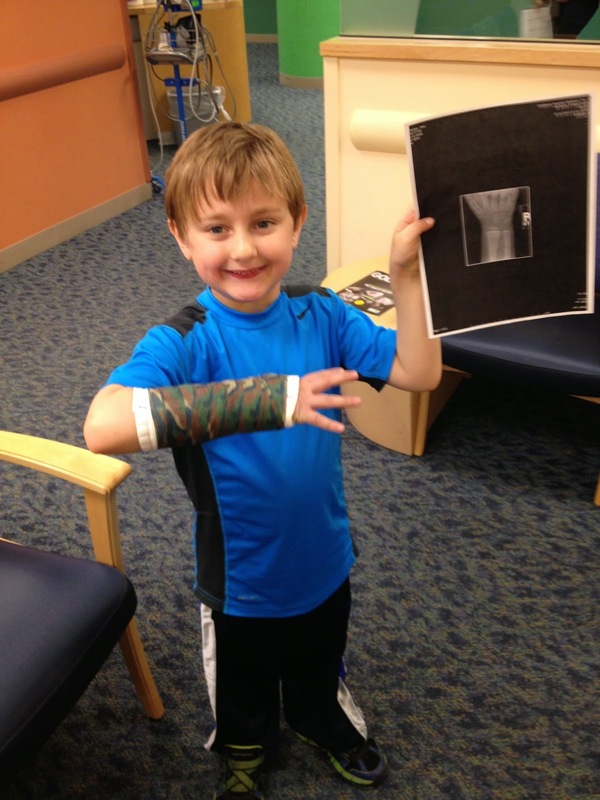 The happiest person to ever get a cast. Remember Max's sprained wrist last week? Not sprained. Fractured. We didn't know until we went for his follow up appointment yesterday, where we were then told we needed to see an orthopedist instead. We did that this morning, and Max is now the proud wearer of a camouflage cast for the next three weeks at least. I stayed calm in the doctor's office when they told me the fracture hadn't been communicated to us, but broke down in the car afterward. Mommy guilt through the roof. I should have called to investigate it myself, because they said fracture was still a remote possibility, and I should have known that meant 100% certainty given this is a child of mine (again, that's me blaming me, not blaming the kid). Max assured me that "the world didn't explode when Hannah broke her wrist" a few years ago, and it wouldn't explode now. But it still broke my heart. "I knew, however, that I wasn't going to hack it as a "real" EMT when I discovered the concept of triage. Our book said the concept originated with the French, and the translation of the word was "to sort." I was horrified by the idea that I'd be responding to some major disaster and have to determine who would get help and who would have to wait, and really, who was beyond help and would have to be passed over. The idea has stuck with me, and while I'm not responding as an EMT, my life often feels like a constant triage." I'm still in a constant state of triage. Or when I'm not feeling fancy and French, I'm playing Whack-a-mole instead. I try to respond to things quickly, because I know something else is probably going to pop right up, and I'll need to smack that one down too. And to be clear, these things are not all problems, like a mole in your garden might actually be, but just the stuff of life. I've developed my processes (like my incessant Google Calendar use) and my techniques (leave the sunscreen on Hannah's placemat so she remembers to use it after she's eaten her breakfast) to try to control as much as I can. But I still struggle that I will never stop playing the game. There will be moments when it slows a bit, sitting on the porch in the sun, but it never really stops. The game has been rigged and never needs more tokens. In moments of injury, the triage seems a bit clearer, at least I hope it would. But even when you do everything right, things can still go wrong. Max will be okay, his wrist will heal. My guilt over it will take more time. And I don't even get a cool camouflage cast. Stress and Strategies: What's For Dinner? Who Else Do You Read?